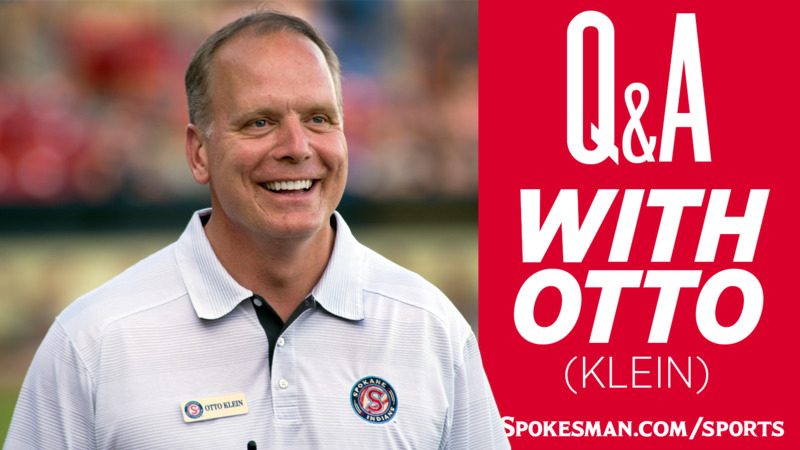 We had a chance to catch up with Otto Klein, senior vice president of the club, to talk about the upcoming season of Spokane Indians baseball. Q: So, just how excited are you for the new season? Klein: Very excited. The ballpark is ready. We’ve been working hard all winter. There’s about 20 of us or so that are here year-round. So we think about baseball from the last game of the season to Opening Day. This is as special for us in the front office as it is for the players who arrive here on the first day. Q: What aspect of what you do in the winter might get lost a little on fans? Klein: It’s a business. Generally speaking, there’s 15-16 full-time employees that we have year-round for the Indians. That’s an exception. Most short-season Single-A teams don’t have that. Maybe anywhere from three to 10. But we feel as though our operation can sustain it. And for our business to be able to put on everything we put on – the concessions, the advertising and promotions, the sponsorships, developing employees, doing all the ticket sales and merchandise – all those things take a lot of thought. It’s important for us to have a staff here. Q: How proud are you of the ballpark and the field? Klein: When we think about some of the awards we’ve won, our grounds crew have won for our field, the playing surface itself has been regarded as one of the best in our league, for 20 out of the last 23 years we’ve won field of the year for our level. Then we’ve won for short-season Single-A field of the year nationally as well a couple of times. So our grounds crew and our stadium team does a tremendous job. Then the stadium itself, and that’s a whole another project to think about. The seats and the concrete and the asphalt and the light poles and all these things. The parking lot and bushes and trees – it all takes an incredible amount of energy. So that’s a part of our routine as well. Q: It’s great that a market like Spokane has such a great facility for its minor-league team. Klein: It’s definitely a luxury. Look, it’s a Triple-A ballpark and it houses a Single-A team. But we don’t think of ourselves as Single-A short-season. We think of ourselves as providing the best baseball possible for the stadium that we have. I think that it’s a luxury. But we don’t take it for granted. We’re great partners with Spokane County. And of course with Avista, our title sponsor. There’s funds that go back into the stadium every year for maintenance – desperately needed – and we take advantage of every bit. Then, as a team, as a business, we put our own capital back into the facility as well. That’s what it takes. Q: How’s the organization’s relationship with the parent club, the Texas Rangers? Klein: This will be our 16th year with the Rangers. We’ve been proud partners with them. They have put a competitive team on the field. And that’s all we ask for – to be competitive. We treat their players like we treat our fans: with the best customer service as we can. There’s housing, there are host families provided for the players, there’s an active booster club that does meals for them. We help the Rangers with the food and the catering for the players throughout the summer. There’s a lot of that that goes into it. But yes, we think about that a lot. Q: Tell us a little bit about Kenny Holmberg, the new manager. Klein: We are excited to have him in Spokane. That immediate experience that he brings to the position, which we enjoy. Not only is he a baseball guy, but he appears to be an excellent person and he gets the big picture. The big picture is that there’s community that is involved here. That it’s not just the game on the field, but how they interact within the community. How they treat the fans. He gets all the importance of the community appearances. For him, it’s about developing the whole baseball player as a human being, and I appreciate that. Q: Tim Hulett was here as manager for 14 years, then Matt Hagen for just one year. Is this a new strategy for the Rangers? Klein: I would say that we’re happy with whoever they provide to us. That’s really their call. I think we’ve been very fortunate. Tim Hulett, not only was he here for a long time, but he got it. Last year, with Matt Hagen and especially this year with Kenny, they get it. They understand that this is development at the lower levels. That this is a special place for them to be. Q: Did we miss anything? Klein: I think that people really appreciate coming to this stadium. And I think when they go to some of the other stadiums in our league, they come back with even more of a sense of ‘Wow, we have something special.’ We never take a day for granted. This ballpark is special. I always say, ‘This is bigger than us.’ It’s 116 years of Indians baseball. It’s a big deal. There’s generations of families that have grown up with the Indians. The aura of the team and playing in this baseball park is bigger than any of us here, and we don’t take it for granted. There’s been championships. There’s been heartbreak. Families come here for entertainment, but they’re passionate. And we’re just as passionate.